The color of light is possibly the most important element you will ever control. Some people are very concerned about the scientific facts about color, some people are only concerned if they think it looks pretty or not, some people consider both. There are no two people alike and color has some many points that are really left up to the individual to decide. Happily, color change is the easiest and cheapest thing to do. So experiment and find what you like. First, let us talk a little about what lighting color is. White light encompasses all colors of the spectrum. No Color light actually has all of the colors in it. By blocking different wavelengths of color, and only letting a specific color through, we achieve individual colors. In other words, a blue light is achieved by blocking all other colors from the spectrum (rainbow). In theatre, it is accomplished by placing a piece of colored gel or glass in front of the light. It is also important to note that there is no perfect or imperfect white light. Some white is bluer and some white is redder. Color is relative to contrast and the “base” white. To illustrate this point think of old fashioned fluorescent tubes. There were the cool ones and the warm ones but both are considered white. If you put the two together, you would see a vast color difference. Therefore, if you are in an office filled with cool fluorescents, the base white is much bluer then if you were in an office with the warm fluorescents. Modern Architectural Lighting Designers often use tri-phosphor lamps that have a full spectrum of color. 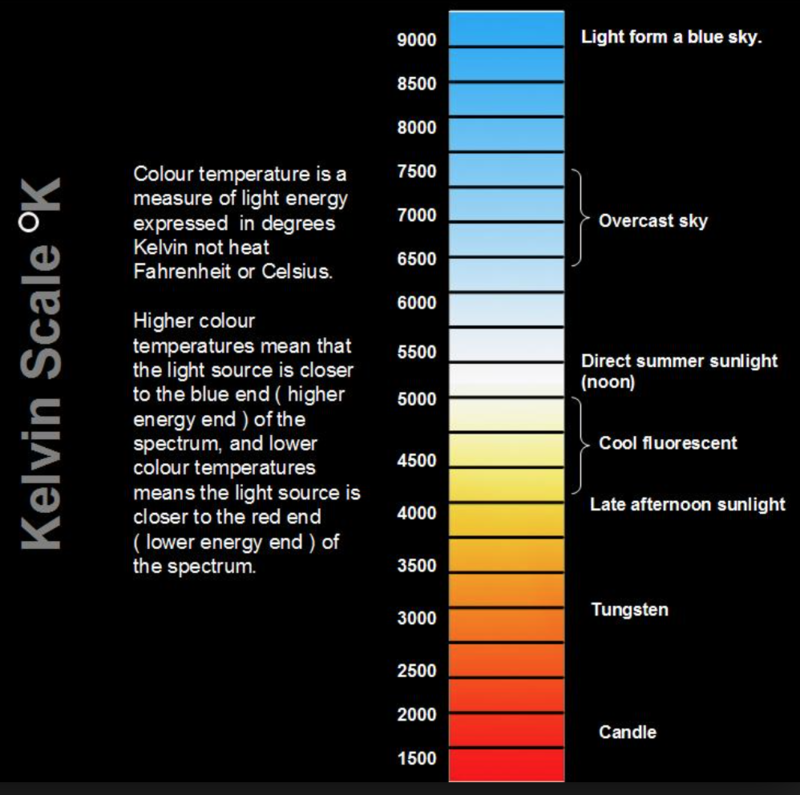 We do have to have some common language on color so the Kelvin Scale is often used in theatre to compare colors. On the technical side of color, we judge it by the Kelvin scale. The higher the number, the bluer, and the lower the number, the redder. As an example, an incandescent table lamp is around 2700 K while the sun ranges from 5600 K to 6500 K. To put this in non-technical language let us talk about the sun. So many people are stuck on the idea that sunlight is amber when, in fact, it is very blue. I believe people think it is amber simply because when they look at the fireball it is amber and so, therefore, must produce amber rays of light when nothing could be further from the truth. Go outside on a beautiful sunny day with a piece of white paper. Have the sun light the paper. The paper will turn a little bluer long before it turns amber. When purchasing your lamps for your fixtures if you want to have consistant color onstage you should purchase lamps that start from the same Kelvin tempreture. If one lamp is 2800 degrees and the other is 3200 degrees and you put the same piece of colored gel in front of the fixture, they will indeed look like different colors. Some other technical things to consider are the primary and secondary colors of light. While there are many artistic similarities to paint and light, there is one major technical difference. That is the color wheel. In paint, the primary colors are Red, Yellow and Blue. The primary colors in light are Red, Blue and Green. 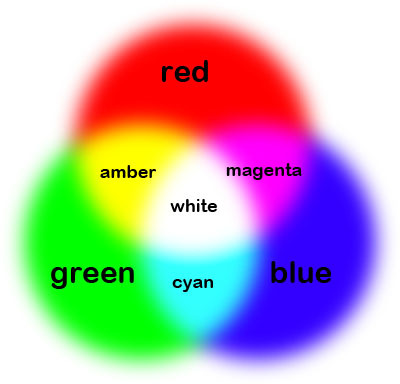 The secondary colors in light are Magenta (Red & Blue mixed), Amber (Red & Green mixed), and Cyan (Blue & Green mixed). Many people will choose the three primary colors on a surface to get all of the color combinations possible. While this sounds like a great idea in theory, I have never been impressed with the actual outcome. Lighting gels are not perfect primaries and the light coming from the lighting unit does not have 100% of the entire spectrum coming from it. On top of that, as you dim lights up and down, their color temperature changes. As the light is dimmed down, the color becomes warmer, so therefore changing the color. In my experience with using the three primaries, you get a nice Red, Blue, Green, Magenta (Red & Blue), Cyan (Green &Blue), but a really murky Amber (Red & Green). The colors also have to be running pretty close to full to look good. If you have a particular color that is not a primary that you want as a background, choose that color and designate a circuit of light specifically to it. Dominant Color – A strong color that will hold its own when another color is put on top of it. The addition of the second color will not change the appearance of the dominant color. Recessive Color – A weaker color that will change when another color is put on top of it. Level of dominance – is dependent upon contrast. Desaturation – is when your eye automatically adjusts to a color and your brain turns it white. The brain strives to have light be white. In a room with no other light but a red one, the brain would desaturate it to the point that it would eventually be seen as white. A nifty trick is taking that red light and instantly turning into a white one. You will see blue-green. This is because the brain has compensated with the opposite part of the color wheel. The white will be seen as aqua. Very shortly thereafter, everything will come back to normal. To avoid desaturation, you must have another color to contrast it. Once the brain has a reference point, it can keep the colors straight. Design Note: Color can hit you over the head or be extremely subtle. Skill in the manipulation of both will serve you well. Never underestimate the small differences in tints and shades. If you have to mimic reality very closely, it is helpful to be aware of some of the facts of color. Fact #1 – The sun is around 5600 deg. Kelvin (light blue). Fact #2 – Incandescent (table lamp) is around 2700 deg. Kelvin (light amber). This is a big difference between the two. You should also know that most theatrical lights are putting out about 3050 deg. Kelvin. Therefore, it is from there you are adjusting. The next thing is to choose your color and put it in front of the light. There is a plastic sheet called “Gel” that comes in 100’s of colors that you use for this. Gel comes from the lightest of tints to the heaviest of saturated color. Many people have the need to project images with stage lights. The need can vary from creating scenery to projecting a company’s logo. The basic principle is that there is a piece of metal or glass placed in the middle of the light that blocks some light and lets other light pass through. It is the light that passes through that then creates the image. If the image is white or only needs to be one color (colored by gel) then a metal gobo is the most cost effective. You can get off-the-shelf gobos for around $13.00 and custom (your logo for example) ones for under $70.00. If you need the gobo to have multiple colors, then you must go to glass and that can range from $200 – $500 depending upon the complexity. You need an ellipsoidal (leko is the slang term) light to project a gobo.